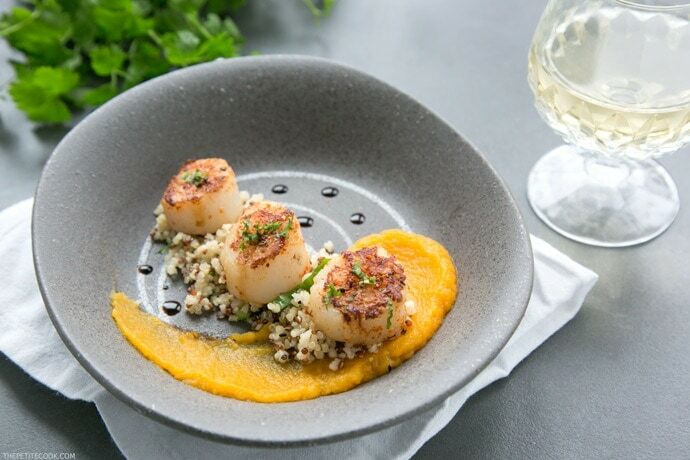 These Spicy Scallops with Pumpkin Puree are loaded with vibrant flavors – Easy and quick to prepare they make an impressive starter or main for any special occasion. Confession time: I’m a HUGE pumpkin fan. And I love to come up with new ways to enjoy this delicious veggie (if you browse the blog you’ll find tons of fun and tasty pumpkin recipes). This time around I’ve paired it with some tasty and juicy seared scallops. I’m a massive seafood & fish lover and I try to make sure my family and I get the recommended 2-portions per week. I don’t always have time to go to the fishmonger, so I often rely on top-quality frozen fish. So, I’m really proud to collaborate with Iceland to raise awareness on the #PowerOfFrozen, to show all the amazing foods you can bring to the table with minimum efforts. Personally, I go frozen as much as I can. Stocking up the freezer with plenty of veggies and fish options, saves me a lot of time (and money). Plus, it helps me cut down on food waste, because you only use what you need and store back in the freezer the rest for later use. More importantly, modern freezing methods lock in valuable nutrients while retaining the quality and taste you would expect from fresh products. Now, back to the recipe. 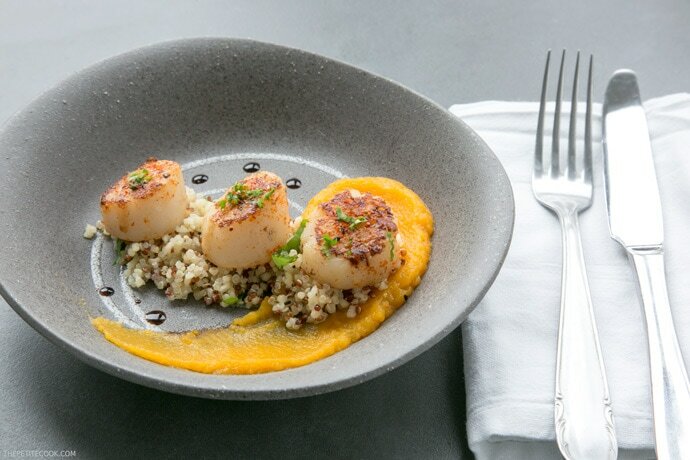 Paired with a refreshing quinoa salad (a simple mix of quinoa, basil and parsley), and a simple pumpkin puree, these delicious Spicy Scallops with Pumpkin Puree are fancy enough to be served as appetizer or main for a special occasion, but so easy and quick to enjoy on a weeknight dinner. 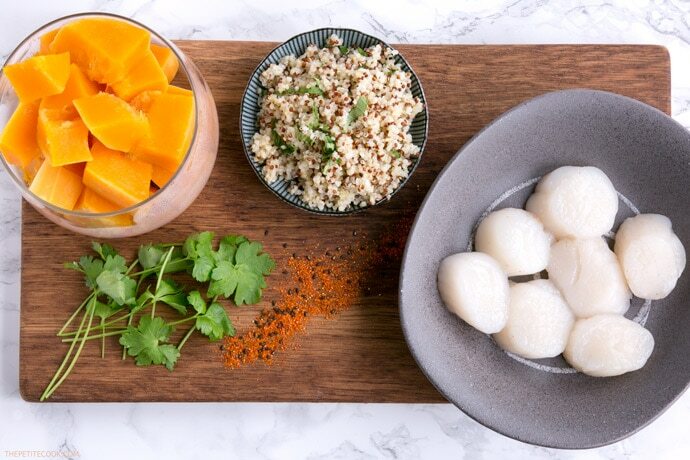 Ready in less than 30 mins, this spicy scallops recipe requires only 7 simple ingredients: pumpkin, frozen scallops, quinoa, yuzu or lime zest, shichimi and a bunch of basil and parsley leaves. These extra large scallops at a mere £12 are such a bargain, and I can safely say they are just as good as the fresh ones. Make sure you allow them to thaw in the fridge for at least 6 hours, or until defrosted. Once the scallops are fully defrosted, place them on a hot pan (I use a cast iron skillet), and sear them for 1-2 minutes per side, until firm and cooked through. Inspired by my recent trip to Japan, I’ve seasoned the scallops with shichimi, a common Japanese spice mix, to add a nice spicy kick and balance off the sweetness coming from the pumpkin. Shichimi is available in any Asian food store, but if you can’t find, simply season the scallops with a bit of chilli powder. To add some contrast and a subtle tangy back-flavor, I’ve used a pinch of yuzu powder, a popular and rare japanese citrus, which can be easily substitute with lime zest. 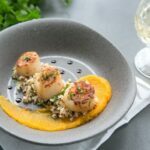 I’ve deliberately decided to serve these scallops with a super simple pumpkin puree, and quinoa (for an extra nutrients boost), but you can opt for any of your favorite grains (basmati or venere rice, farro and barley are a few of my favorite alternatives). Packed with nutrients and bold vibrant flavors, these Spicy Scallops with Pumpkin Puree make a lovely gluten-free starter and are sure to steal the show at your next dinner party! Packed with nutrients and bold vibrant flavors, these Spicy Scallops with Pumpkin Puree make a great gluten-free starter, and are sure to steal the show at your next party dinner! Steam the pumpkin for 15 mins or until soft and tender. Season with salt, pepper and pinch of ginger to taste. Transfer in a food processor and blend until smooth. Set aside until ready to serve. For the quinoa salad, simply cook the quinoa in a large pot of lightly salted boiling water for 9 mins. Drain in a sieve or fine colander and cool down. Mix the quinoa with extra virgin olive oil, yuzu powder and basil & parsley. Season to taste. In the meantime, prepare the scallops. 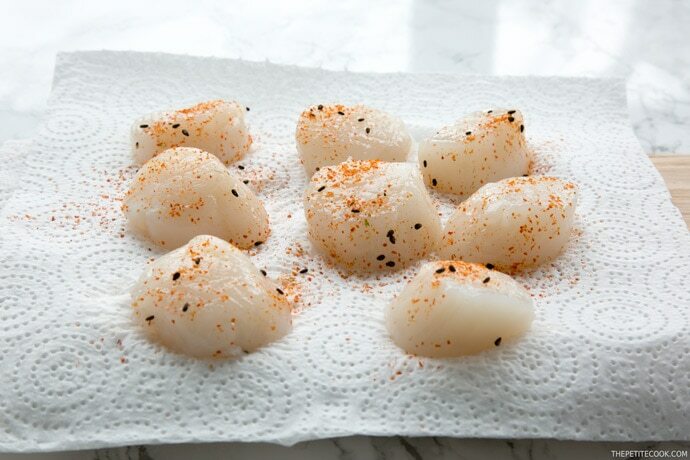 Pat the scallops dry with kitchen paper and season with sea salt, yuzu and shimichi. 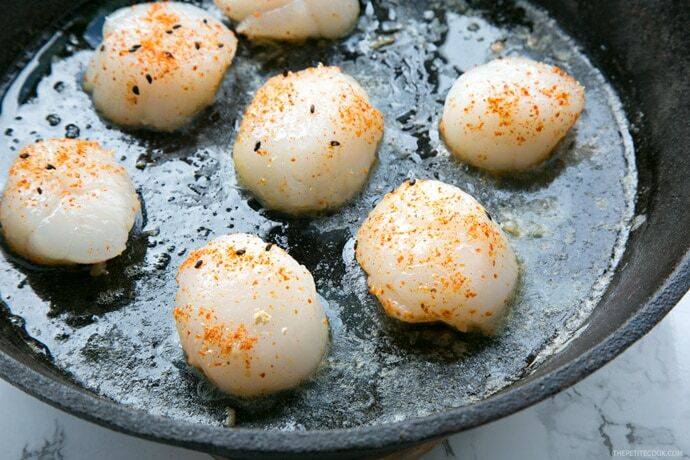 Heat a large skillet with olive oil and butter, then grill the scallops on each side for a minute on each side, or until they’re cooked through and crispy and golden. Remove from the pan and rest on a warm surface for 2 min. 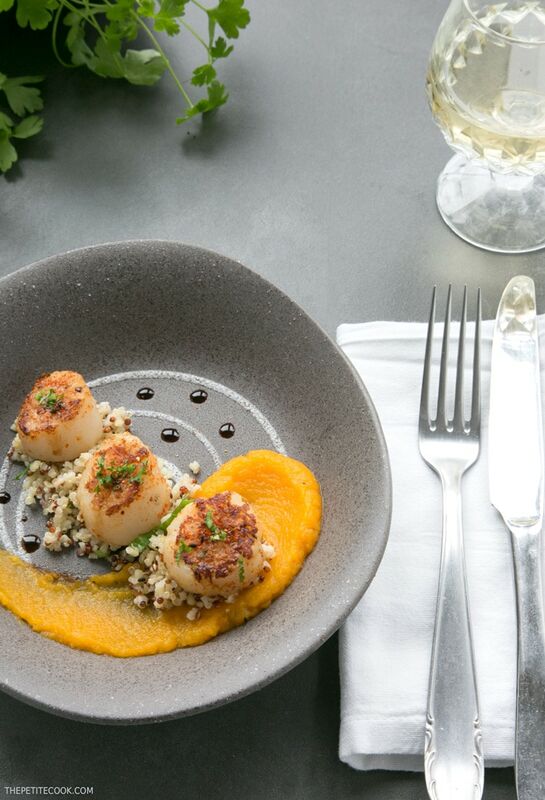 Serve the scallops on a bed of pumpkin puree with the quinoa salad on the side. If you have more time, you may roast the pumpkin instead of steaming for extra flavor. Simply arrange the pumpkin cubes on a tray, season with salt and pepper and a glug of olive oil, and cook until tender, about 30 mins. This post is sponsored by Iceland, and as usual all opinions are my own. I’ve been regularly shopping at Iceland for a long time, and can only recommend it to all of you! Thank you for supporting the brands that support The Petite Cook. Hi! Wondering what the black dots are on the plate? Thanks! Looks lovely! Hi Coco! The dots on the plate are made with soy sauce. I personally like the nice contrast it gives to the sweetness coming from the pumpkin and scallops. I bet Japan was AMAZING! This recipe looks delicious and is something I think my husband would enjoy. He loves scallops. Beautiful presentation too! I love the sound of the yuzu powder in the pumpkin puree – It sounds such a great way to flavour the pumpkin! Unfortunately I can’t eat scallops because of an allergy but spiced pumpkin is definitely a big favourite of mine! What an absolute beautiful recipe!!! OH, how this speaks to all my tastebuds! I love yuzu with seafood and love that you used fresh pumpkin . Great combination!! Beautiful recipe and beautifully presented too! I love all things seafood and Japanese, this is a winner!